Be real. Be knowledgeable. Never fake it. In other words, don’t lie. Don’t misrepresent. No BS allowed. Unfortunately, however, this is much easier said than done. Sometimes you simply can’t help but stretch the truth a bit. Exaggerate. Enhance. “Why yes, our gumbo is the best I’ve ever had!” Or, “Your food will be right out,” when you know the kitchen actually just began its preparation and you’re facing at least a twenty-minute wait. Or, say, that we put alligator in our bloody mary’s. And what about those questions you simply don’t know the correct answer to? Sure, you can always do the “I-don’t-know-but-I-will-find-out-for-you” thing, but sometimes that can be just plain embarrassing. If there’s really no such thing as a stupid question, only stupid answers… Well then, not knowing or giving an incorrect answer, frankly, just makes you stupid. So sometimes you have to wing it, and come up with the most truthful response you can muster at the time. My last job, we served stuffed mirliton. “Can you tell me about the mirliton?” a guest once asked me. “Mirliton is a fish,” I told the guest. I really didn’t know any better. I thought this was true. The guest was naturally surprised to see a pepper-like vegetable come out of the kitchen, so to cover my tracks, I then assured him that the fish was inside. Oops. Yes, when in doubt, improvise. Or else, deflect. “A delicacy” has a much more appetizing ring to it than “cow pancreas”. Or, in the case of, “Can you describe the steak dish?” Simply tell them: “Oh yes, it’s good!” (“Good” is always a safe bet, and more times than not, completely honest). 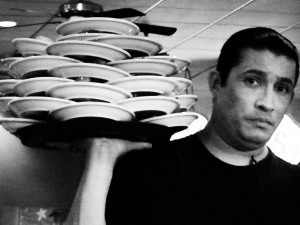 This article is about some of the things that I have heard working in the restaurant biz that may or may not be entirely true. I would never dare accuse anyone of out-right lying, or intentionally falsifying information (except maybe my ex). But I have formulated a list of what we can call embellishments, possible inaccuracies, or creative license. Stories told in the name of entertainment or humor, as a selling point, or simply an honest mistake. I leave them to your interpretation, because reality is in the eye of the beholder. So is honesty. Nothing gets more mileage in this city than a good ghost story. The creepier the better. 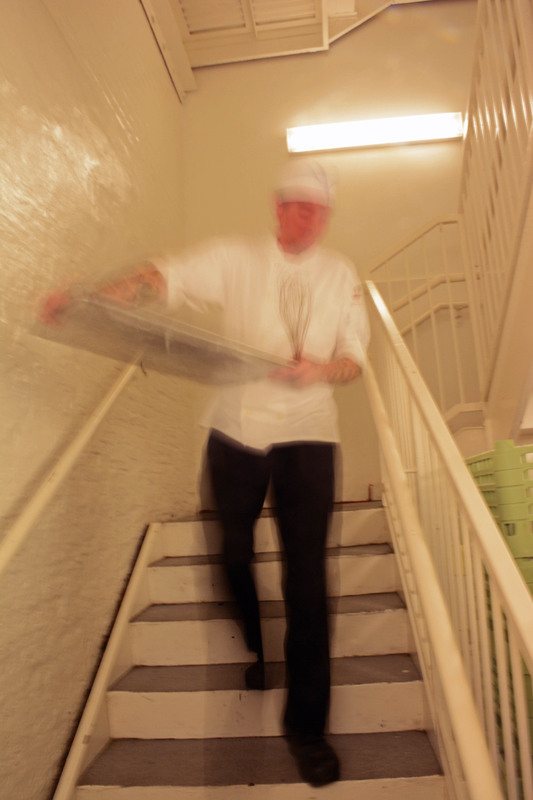 I have worked in more than one restaurant which brought the tourists running with promises of ghost tables and séance rooms and mischievous ghosts who haunt the premises and make their presence known by breaking glasses or un-setting tables. (Then again, that could also be attributed to clumsy or spiteful co-workers). People make a killing selling those haunted ghost tours to morbid tourists who are simply dying for such things. But you have to wonder how much is actual historic fact and how much is the tour guide’s clever whims. At my restaurant, we have a couple of ghost stories of our own which we like to spread around. Supposedly the restaurant’s original chef, who died long ago, was known to frequently whistle in the kitchen while cooking up his famous dishes. Now staff and guests alike claim to have heard a mysterious whistling in the stairwells, originating from an invisible source. And we once had a guest report that she saw a man standing outside the bathroom when she came out. He didn’t seem well, and she noticed blood on his neck. Concerned, she followed him into the other room, where he suddenly disappeared from view. Rumor has it that the first owner of the house the restaurant now occupies hung himself on-site. Just a coincidence? On a similar note, we have a server who has had a hard life and looks like it. He is one of my favorite people out there and I love him to death, but he is the human equivalent of a vandalized storefront. 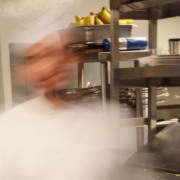 Once another server pointed him out to a guest and told him that he is really our resident ghost and that he haunts the building. I never heard if the guest bought the story or not. Either way, the living ghost server guy would probably be the first to admit that this is really not so far from the truth. Guests ask us all the time how fresh our ingredients are. Apparently freshness is a big deal for people when they eat. I am not a real stickler for this myself, since I eat yogurt three months past its expiration date (come on, those dates are really pretty arbitrary anyway). But I get it. Things do tend to taste better when they’re newly made. Old bread gets tougher and old fruit gets softer and old soda loses its fizz. Not to mention we live in a world where everyone is paranoid of germs and bacteria and foodborne illnesses. So sometimes you simply have to tell people what they want to hear. When they ask us if the orange juice is fresh-squeezed, we answer honestly: “Well, it says fresh-squeezed on the bottle.” This is true. It does. So I guess it must be fresh. Bottles don’t lie, right? But if they are looking for us to be picking oranges from the courtyard (we really do have citrus of some sort growing there) and juicing them in the back… no, our juice is not that fresh. And I have been told that in other restaurants (not mine, allow me to say, in case management is reading this), staff has been known to try to pass off their seafood as fresh. “We get shipments of shrimp straight from the Gulf every single day. The fishermen bring them directly to us, right up the Mississippi, and they are still alive and squirming when they reach the kitchen”. When in reality, they are actually fresh from the freezer. Which is still its own sort of fresh, I suppose. To be fair, I have seen “Fresh Frozen” on more than one box of seafood (again, not at my job), and some people actually see this as a good thing. Freshness is relative. Everyone has their own freshness requirements. Your spoiled, expired yogurt is my…well, lunch. We had a guy telling guests that our meat was so fresh, we actually had a meat-hanging room upstairs, with prosciutto hanging from the rafters and rabbit tenderloins piled high. The truth is that we do serve freshly-cured meat, but we prefer to keep the slaughterhouse off-site. We long ago corrected this particular gentleman and he has since changed his story. 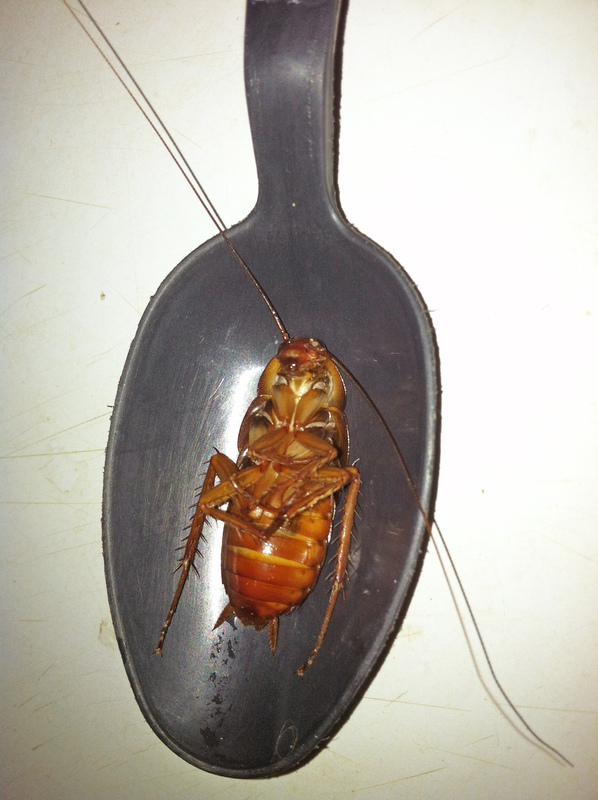 I worked in a restaurant awhile back which had a clan of cockroach tenants (one more time, not where I work now). On more than one occasion, a rogue roach would run across a table where a guest was dining, or go scurrying up the wall nearby. We did have some folks walk out because of it, but other times one of the servers had a whole sermon on standby, ready to use when needed to calm them down and alleviate their repulsion. He would explain that roaches are simply an inevitable part of life here in New Orleans. That there is just no way around the fact that they are going to be everywhere, including in restaurants. They have the upper hand—in fact, they have about six of them—so there is no real way to rid yourself of them. Basically, since they are boss, it is best to just attempt to peacefully coexist. This is all true, of course. But, on the other hand, what is clearly a bug-induced fable came from a friend at work. She told me she used to work in a place that had, as she put it, “a vermin problem”. When a guest complained that there was something crunchy in her red beans and rice, this young lady naturally feared that there might be a little hitchhiker with an exoskeleton stealing a ride on the plate. Because, she said, “Red beans and rice are not supposed to be crunchy.” (Really?) Thinking on her feet, she quickly came up with a feasible explanation for this unexpected lagniappe, telling the guest that the crunchiness must certainly be due to the ham in the red beans and rice. She went on to explain that the brown sugar on the ham had probably caramelized during cooking, causing the ham’s skin to take on a crispiness, resulting in said crunch. Nice. Serious points for spontaneity! Back in 1951, a huge percentage of bananas being imported from Central and South America passed through the port of New Orleans. At the famous Brennan’s restaurant, owner Owen Edward Brennan jumped on the banana bandwagon, and asked his head chef at the time, Paul Blangé, to create some sort of edible banana masterpiece in honor of the plentiful fruit. 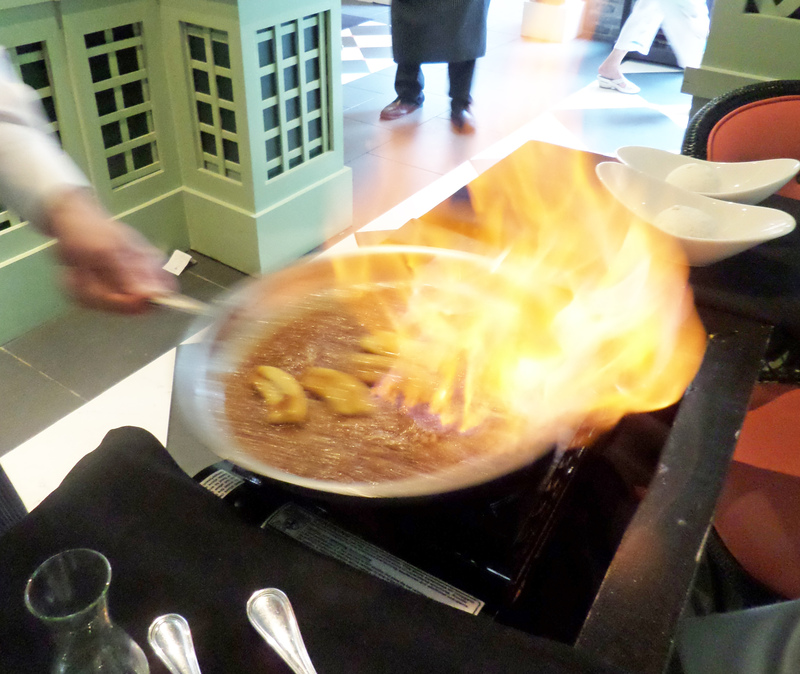 Bananas Foster was born. The famous dessert was named for Richard Foster, a Brennan’s regular and buddy of restaurateur Owen Brennan. The two knew each other from their common work on the New Orleans Crime Commission, whose main objective was to clean up the French Quarter. They were just a couple of banana-wielding superheroes swooping in to save the Quarter and enrich lives with decadent desserts. That’s the simple version. But this story has more alterations than a fat girl’s wedding dress. Some people add additional details, with varying degrees of verifiable accuracy. Such as the fact that the river was too low for the ships to carry the bananas upriver, and therefore they all got stuck in New Orleans, causing an insurmountable banana surplus in the city. Or the fact that Richard Foster owned the Fosters Awning company, still in existence today. I’ve even heard some folks go so far as to say that Mr. Foster supposedly ate at the restaurant five times a week, or that his awnings are famous for being decorated with a single stripe, usually green. 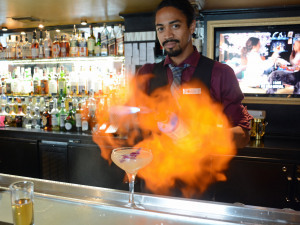 One server even insists that during the restaurant’s recent 20 million dollar renovation, they excavated bottles of banana liqueur—a major ingredient in bananas foster-- from between the bricks in the walls, trapped in hiding since the 60’s. Maybe so. But, true or not, where do people come up with this stuff? Personally, I tend to point out to the guests that if today’s crime rate is any indication, clearly Mr. Brennan and Mr. Foster were unsuccessful at their crime-fighting attempts. The New Orleans Crime Commission seems to have passed on a lot of unfinished business to the NOPD. One ex-server, no longer employed there, used to say that there were so many bananas in New Orleans at the time, they were literally falling from the sky. But why stop there? Why not get really creative? We could make things extremely far-fetched…like telling folks that Owen Brennan actually had a potassium deficiency and had to import 35,000 pounds of bananas annually to treat it. Or that the banana overkill in the city was really an attempt to pacify and feed 1400 monkeys who had escaped from the circus when it came to town, and were running wild in the French Quarter. Or maybe that the excess bananas were in fact props for a Carmen Miranda-inspired drag show. Speaking of monkeys, here’s a doozie I heard just the other day. Apparently there is some rare coffee bean somewhere in Indonesia, known as the kopi luwak. A certain breed of monkeys eat the bean, and dispose of it the usual way, as per nature’s demands. The bean is then harvested from the monkey’s feces, and recycled for human consumption. They say it tastes better the second time around. Well, the bartenders at work were discussing the idea of creating a fabulously exotic coffee-flavored cocktail—in the true fashion of the craft cocktail craze prevalent today—made with the pooped-out bean. To keep the bean as fresh as possible (see number 2 above for importance of freshness), they suggested keeping a little trained monkey in a cage behind the bar, to get the bean directly from the source. These cocktails would of course be made-to-order on demand, but could possibly require a significant preparation and waiting time, depending on how the monkey was feeling at the moment. Obviously this particular discussion was mainly done in jest. But some of the best tales ever told to tables evolve from people who simply have a plethora of trivial knowledge, along with an uncontrollable desire to share their unique and sometimes quirky expertise on a particular topic with the guests in the restaurant. Case in point, I have overheard a certain waiter, who refers to himself in certain company as Mr. Funky, telling guests things that may be very much true, but are so random and odd that they could probably go their entire lives without requiring said information. Yet I am sure our guests’ meal was doubtless greatly enriched by learning it. 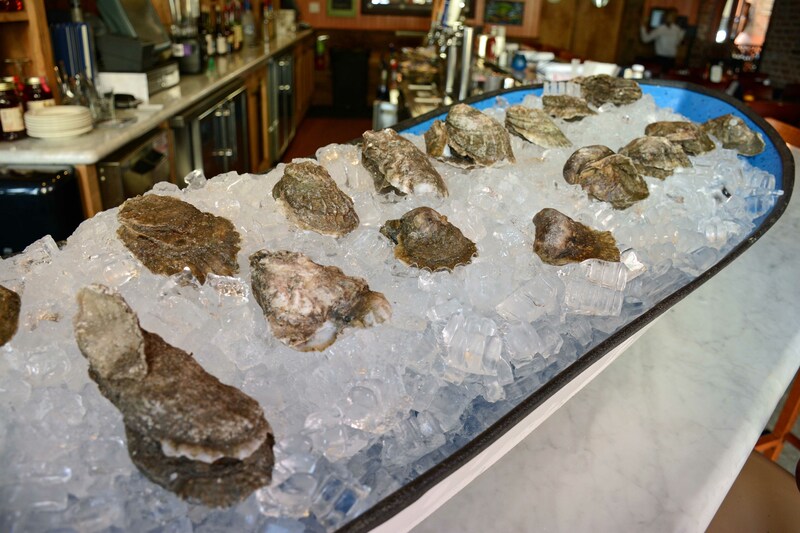 One of his go-to stories is something about how oysters can’t travel on planes, because at altitudes greater than 10,000 feet, the oysters will depressurize, causing them to break down and become frothy. Just like a cappuccino. That is why, he says, oysters don’t stray far from their sea of origin. They don’t travel well. I also overheard him telling some strange anecdote about using pigs to harvest truffles—which apparently grow in very close proximity to trees-- since the pigs can smell the truffles and very much enjoy eating them, and therefore will find them at all costs. There was one particular truffle forager whom Mr. Funky speaks of, who had to retire from his career due to a concussion (who knew truffle hunting could be as dangerous a job as that of an NFL linebacker?) The truffle hunter’s head injury was caused by an extremely hungry pig pulling on his leash in a truffle-crazed frenzy that dragged the man headfirst into a tree. While the forager was knocked out unconscious, the pig ate all the truffles in the vicinity and then dragged the man behind him by the leash to the next tree. Just normal table-side conversation, don’t you think? The truth is indeed often stranger than fiction. And sometimes (though obviously, not always) it can also be far more boring. But whether legit or fake, people like to come away with a good story…even when it might not be entirely realistic. Why else would we read Harry Potter? Most of us believe what we want to believe anyway. Like Santa Claus. But does truth really trump entertainment? I am not convinced…just as I am not entirely convinced by some of these Tales from the Table which I have just told you about. But that’s okay. Many times what separates a good story from a great story is merely its level of BS. How good you make your story depends on just how high you let your BS Index climb.